The Cads of London Feasting the Wild Westerners. Correspondence Philadelphia Press: I was told yesterday of an amusing scene witnessed by an American gentleman. An English baronet with single eye-glass and very English accent was asking a couple of cowboys to dine with him. "Be kind enough to give me your cards," said the baronet. "Well, to tell the truth," replied the rather embarrassed young men, "we haven't got any." "Oh, never mind*&a mere formality cards are, you know. Not neccessary at all, my dear boys. Lady F---- will be delighted to meet you. What are your engagements for the week?" The young fellows looked at each other and said: "Most any night would suit us, I guess." "Delighted, you know. Well, say Friday night. We shall expect you Friday night. Quite informal. Never mind dress suits." The two cowboys went, and I have no doubt behaved very nicely, but it will be surprising if the fuss being made over them here does not spoil some of them. George W. Smalley  writes from London to the New York Tribune: "An episode of Buffalo Bill's career. 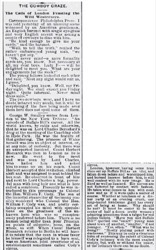 All the world knows, by cable and otherwise, that he was on Lord Charles Beresford's  drag at the meeting of the Coaching club in Hyde Park. He was the feature of that gathering. The princess of Wales  herself was less an object of interest, or, at any rate, of curiosity. But there was an unreported incident. Count Herbert Bismarck  was then in London as he is now. 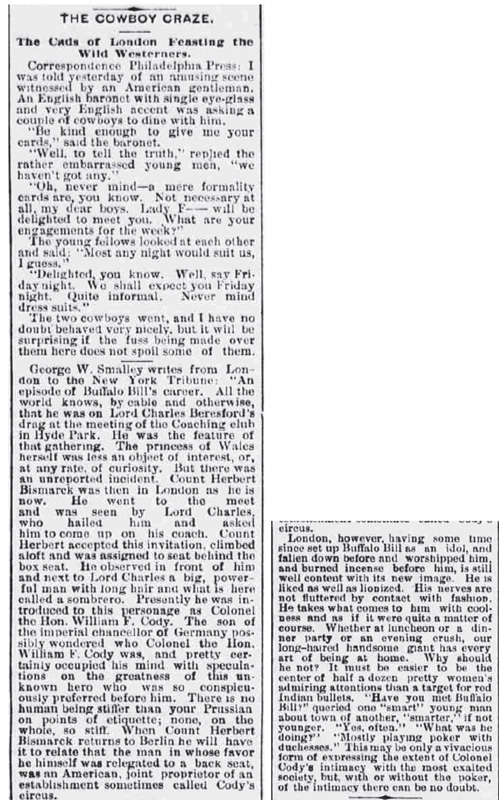 He went to the meet and was seen by Lord Charles, who hailed him and asked him to come up on his coach. Count Herbert accepted this invitation, climbed aloft and was assigned to seat behind the box seat. He observed in front of him and next to Lord Charles a big, powerful man with long hair and what is here called a sombrero. Presently he was introduced to this personage as Colonel the Hon. William F. Cody. The son of the imperial chancellor of Germany  possibly wondered who Colonel the Hon. William F. Cody was, and pretty certainly occupied his mind with speculations on the greatness of this unknown hero who was so conspicuously preferred before him. There is no human being stiffer than your Prussian on points of etiquette; none, on the whole, so stiff. When Count Herbert Bismarck returns to Berlin he will have it to relate that the man in whose favor he himself was relegated to a back seat, was an American, joint proprietor of an establishment sometimes called Cody's circus. London, however, having some time since set up Buffalo Bill as an idol, and fallen down before and worshipped him, and burned incense before him, is still well content with its new image. He is liked as well as lionized. His nerves are not fluttered by contact with fashion. He takes what comes to him with coolness and as if it were quite a matter of course. Whether at luncheon or a dinner party or an evening crush, our long-haired handsome giant has every art of being at home. Why should he not? It must be easier to be the center of half a dozen pretty women's admiring attentions than a target for red Indian bullets. "Have you met Buffalo Bill?" queried one "smart" young man about town of another, "smarter," if not younger. "Yes, often." "What was he doing?" "Mostly playing poker with duchesses." This may be only a vivacious form of expressing the extent of Colonel Cody's intimacy with the most exalted society, but, with or without the poker, of the intimacy there can be no doubt.